*Note: This is a fundraising event with the proceeds going to the Metal Arts Building. The CBA Instructor is donating his time. All additional donations are appreciated. Horsehead - Dave will demonstrate how to make an ornamental horsehead that can be used to enhance your next project. He will also demo how to make the tooling for this design. 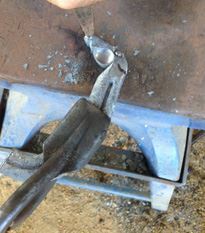 *Tools to bring: forging hammer, ball-peen, & tongs. Safety glasses & hearing protection required.